The project will upgrade around 35 kilometres of The Northern Road between The Old Northern Road at Narellan and Jamison Road at South Penrith. The project will see The Northern Road upgraded to a minimum four-lane divided road, and up to an eight-lane divided road with dedicated bus lanes. The Old Northern Road, Narellan and Peter Brock Drive, Oran Park (3.3km). Peter Brock Drive, Oran Park and Mersey Road, Bringelly (11.3km). Mersey Road, Bringelly and Eaton Road, Luddenham (5.5km). Eaton Road, Luddenham and Littlefields Road, Luddenham (4.5km). Littlefields Road, Luddenham and Glenmore Parkway, Glenmore Park (6km). Glenmore Parkway, Glenmore Park and Jamison Road, South Penrith (4km). 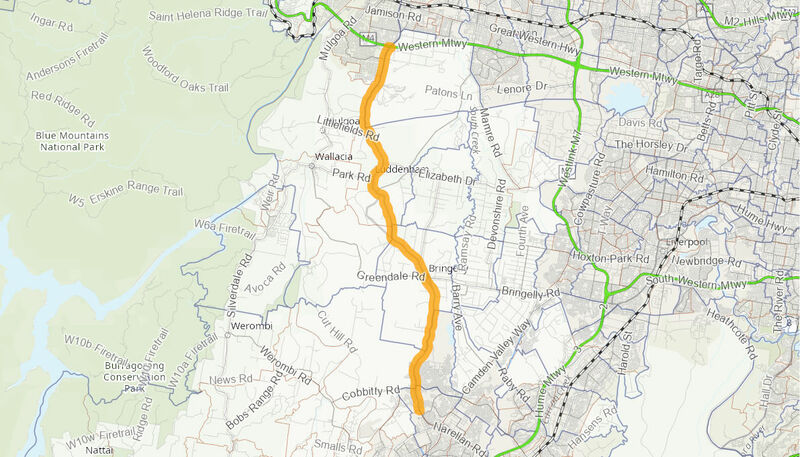 The first section will involve the southernmost section of the road near Narellan. The upgrade to The Northern Road will also include interchanges with the new M12 Motorway, the M4 Motorway and Bringelly Road. The Northern Road upgrade will improve safety, provide improved road linkages within the western Sydney region, increase road capacity, reduce congestion and travel times, and support the region’s growing population. The total cost of the project is $1,584.5 million. The Australian Government is providing $1,233.5 million and the NSW Government is providing $351 million towards the construction of this project. Construction on the first section of the upgrade commenced in January 2016. The full upgrade is expected to be open to traffic in 2022.